Today's first game at 4:30 PM is a rematch of AFC North rivals Baltimore and Pittsburgh. These are two of the most hard hitting and ferocious teams in the NFL. Their serious dislike for each other means that this is going to be a very fun football game to watch with both defenses getting after it. This battle is going to come down to pressure, can either team get pressure on the QBs before they can find an outlet? 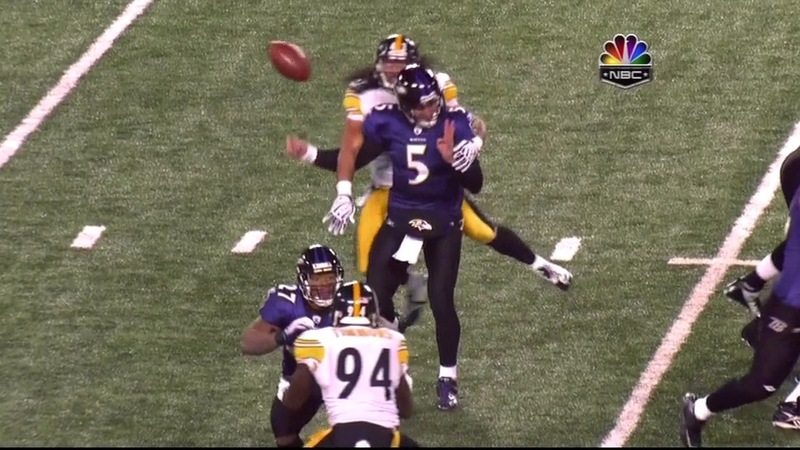 Pittsburgh probably has the advantage in this regard if Troy Polamalu is healthy. He is going to be playing but how effective is he going to be? If Polamalu is even a step slow it gives Baltimore QB, Joe Flacco more time to get the ball to Running back, Ray Rice. Rice is my key to the game for Baltimore. They are going to have to get him going if they hope to beat the Steelers tenacious D.
Last week Baltimore blew out the Chiefs by forcing lots of turnovers and consistently hitting short yardage targets in the passing game. Flacco was able to find Tight End Todd Heap over the middle for a 10-20 yard gain just about whenever he wanted to. That's going to be a lot tougher to do against Pittsburgh who has an entire 53 man roster full of athletic Outside Linebackers that can cover TEs just as well as they can rush the passer. Expect lots of screens to the aforementioned Rice who is going to have a tough day but he's going to have to make those OLBs miss if the Ravens hope to win this one. The Steelers offense is facing a very tough Ravens run defense. Middle Linebacker, Ray Lewis infamously broke Steelers Running back, Rashard Mendenhall's shoulder on a run up the middle after the two teams were talking trash in the week leading up to the game during Mendenhall's rookie year. Actually according to ESPN neither team has allowed a 100 yard rusher in their last 28 combined playoff games. 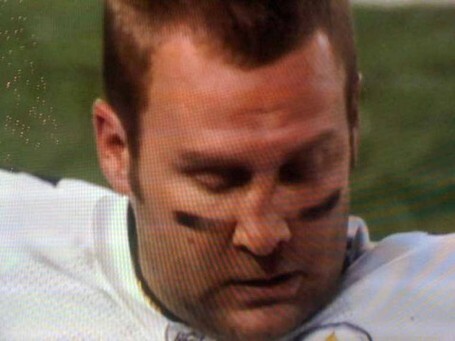 Which means that Big Ben is going to be looking for Wide Receivers, Mike Wallace and Hines Ward today. Wallace is one of the fastest WRs in the NFL and he will be hoping to exploit Baltimore's weaker group of Cornerbacks. At the end of the day, I don't think Baltimore is going to be able to get around all those great defenders in Pittsburgh. Roethlisberger will be able to stand up to the Baltimore rush a little better than Flacco will and to me, Mike Wallace is the playmaker that really separates these teams. Pittsburgh takes this one 20-17. Tonight's game will feature the Green Bay Packers traveling to take on the NFC's top seeded Atlanta Falcons. The Falcons QB, Matt Ryan, has only lost 2 home games in his three years playing in the NFL so the Packers are going to have a tough time beating Matty Ice at home tonight. The Packers are coming off of a tough win against everyone's favorite, Philadelphia Eagles where they were able to shut down Mike Vick's scrambling while blanketing Desean Jackson and essentially taking him out of the game. The Packers are going to face another tough offense with play makers at every level, from QB Matt Ryan, RB Michael Turner, TE Tony Gonzalez, and WR Roddy White. Turner has been a good Running Back in Atlanta but he is one of the most hot and cold performers in the league. There are games where he'll just completely disappear. Atlanta has to be hoping that he will show up tonight because their Wide Receiver, Roddy White is going to be facing off against one of the best cover corner's of all time in Charles Woodson. The difference maker for Atlanta today is going to be Tony Gonzalez. He will be matched up against the Packers 18th string Linebacker due to injuries to everyone but Clay Matthews in that position group. Watch for Matthews to be chasing Ryan all day long in hopes of creating turnovers and preventing those deep passes to White. Aaron Rodgers has been playing great this year and although the Falcons have some good cover corners, I still think the Packers will be able to take advantage of these matchups. Atlanta Cornerbacks, Dunta Robinson and Brent Grimes will be facing a tall task today as they are asked to stop Greg Jennings, James Jones, Jordy Nelson, and Donald Driver. The Falcons typically like to rush with only their front 4 which includes studs Kroy Biermann and John Abraham. If they are able to get pressure on Rodgers, this is going to be a very good game. Although Green Bay had been without a running game almost all season, their rookie, James Starks exploded last week against the Eagles. He'll have a tougher matchup today because the Atlanta Linebackers just get to sit back and key on opposing Running Backs. Despite Atlanta's fantastic record at home and their offensive threats, I don't see them hanging with Green Bay today. The Packers are just playing great football on offense and defense right now. Their improved offensive line should do a good job keeping Rodgers upright which will give him time to find all those great Wide Receivers. The Packers pressure defense and Woodson's coverage on White should also help Green Bay win the turnover battle. Packers win today 30-24.